During the 1840s in the prosperous seaport of Baltimore a unique quilt style was born, The Baltimore Album Quilt. The quilt blocks consisted of varied motifs including elaborate floral applique and making them was a popular pastime among the well-to-do. 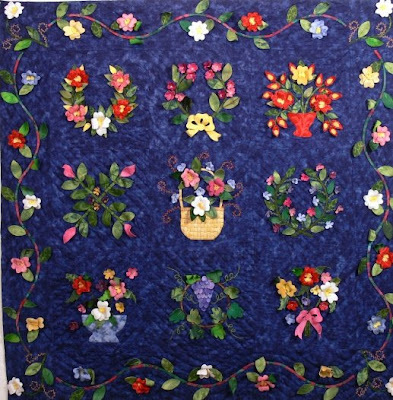 Over a century and a half later Joan Shay created a three dimensional Baltimore album quilt and offers the pattern at her site, Petal Play. In her patterns, books and classes she teaches a unique technique using "HeatnBond" along with other modern tools and materials that the social elite of long ago Baltimore would never have imagined. If you love creating in new ways I think you might enjoy her techniques and instructions to make this delightful modern day 40" by 40" Baltimore Album Quilt. In the process you will be making a fascinating connection between the old and new.